This Glaswegian folk duo formed in the late sixties. Not surprisingly with Billy Connolly in their line-up they were known for their humourous songs. Their first album made quite an impact and after this Gerry Rafferty was asked to join them. They worked as a trio for six or seven months before Harvey was pushed out of the band. Connolly and Rafferty proceeded to record three more albums. The first of these, A Collection Of Merrie Melodies, was performed entirely on acoustic instruments, most notably the banjo and guitar and reflected Connolly's traditional folk inclinations. The New Humblebums contained some good material, particularly Please Sing A Song For Us and Her Father Didn't Like Me Anyway. It was more melodic than the debut and featured some fine melodic woodwind and brass arrangements. Open Up The Door veered more towards pop and the duo used session musicians to achieve a fuller sound. The album featured Barry Dransfield and Bernie Holland of Jody Grind. However, this created difficulties for the duo in reproducing many of their songs on stage. Under pressure from their record company to form a backing group the two of them agreed to go their separate ways... not a bad decision as Connelly became a successful comedian and Rafferty a successful solo artist after first joining Stealer's Wheel. 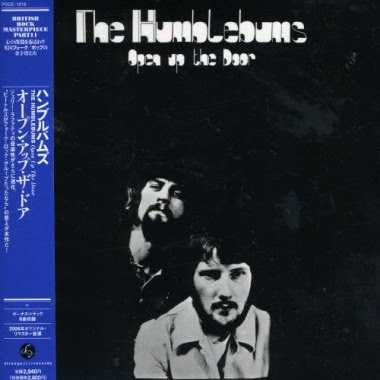 If you missed The Humblebums first time around and think they sound interesting you may like to invest in their complete three album set which contained the album's original sleeve artwork and came in a nice outer slip case. However, this came out in 1974 and is not that easy to find now.